The origins of this very popular pasta dish aren’t clear. 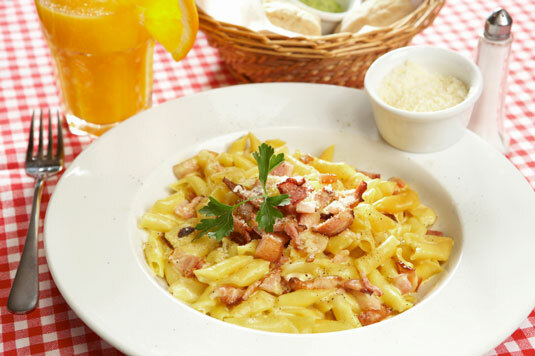 Some sources indicate that carbonara originated right after World War II, when the egg and bacon rations of American GIs were turned into a pasta sauce. Other sources say that coal miners (carbonari) made this dish. Either way, this dish has become extremely popular throughout Italy. Onions are a delicious addition to the sauce, but they’re optional in this recipe. Place the olive oil, onion (if using), pancetta, and red pepper flakes in a large skillet and cook over medium heat, stirring occasionally, until the onion is soft — about 10 minutes. Pour the wine into the pan and let it reduce for 3 minutes. Season with salt and pepper. Remove from heat. In a large pot, bring 4 quarts water to a boil. Add the kosher salt and the penne, mix well, and cook until the pasta is al dente. Drain the pasta and add it to the skillet. In a large bowl, mix together the eggs, cream (if using), 1⁄4 cup Parmigiano-Reggiano cheese, and parsley. Slowly add this mixture to the skillet with the onion and pasta. Mix well. Cook over low heat, stirring constantly, for 2 to 3 minutes to heat the eggs through. Don’t boil. Sprinkle with the remaining 2 tablespoons Parmigiano-Reggiano cheese and serve immediately.